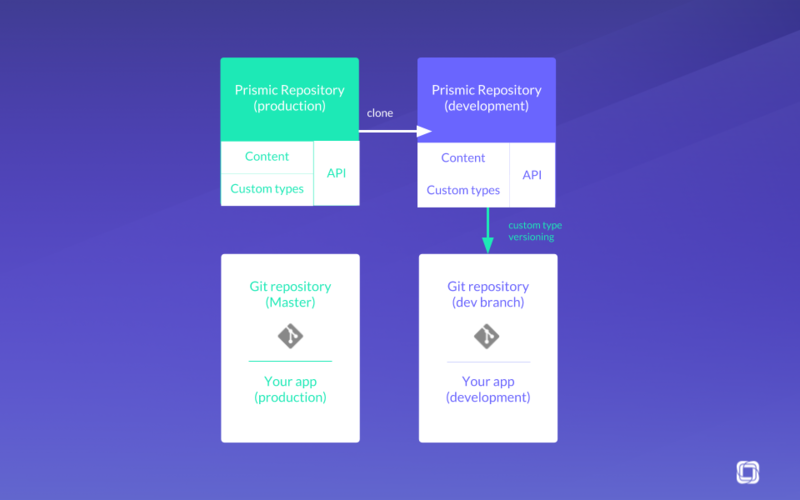 The ability to clone a Prismic repository to development or staging environments is available on the Platinum and Enterprise tiers. Reach out to the Sales team to learn more. Previewing a new collection of content does not require a separate environment. 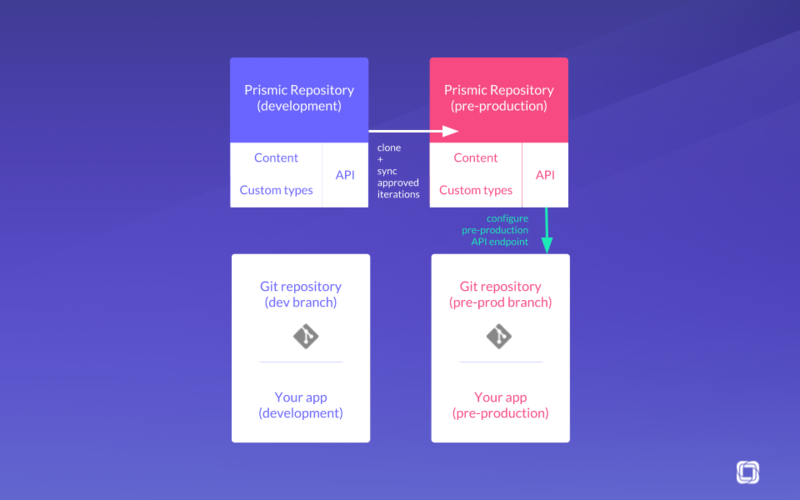 Prismic provides tools to natively include the preview capability, directly configured on production environments. Read more about previews. We recommend that editors always stick to the Production environment to experiment with new content sets. This will make their life easier, and developer’s life as well: no need for content migrations from Dev to Production repositories. However, if you need to make changes to your content model, you should consider using a separate environment. When one changes the Custom Type configuration, this impacts the Prismic API responses. Depending on the stage of your project, you might be concerned about your API responses changing. For instance, if your project is in production, removing a field in the Custom Type might break your site. When a team needs to make some changes to their Custom Type (adding or removing fields, creating new Slices, etc. 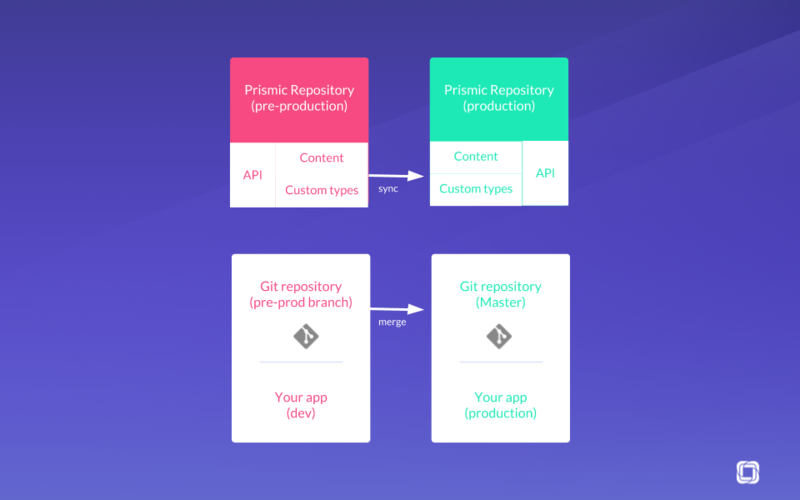 ), it is useful to have a separate clone of your production Prismic repository to safely make these changes. Iterating on the custom types model always implies changes in your templates’ code. For instance, adding a field to the Prismic custom type requires an update on your code so that the new field’s content can be displayed on your front-end. That’s why we recommend that any iteration on the custom types are versioned along with your code, so you know which Prismic configuration corresponds to which branch of your code. You can easily track your custom type versions by versioning their JSON representation in a “Custom Types” folder of your application code repository. Let’s assume you have to ship a new feature including changes in your custom types. First, safely test the content model changes on a separate Prismic environment which is linked to the corresponding branch of your code. Once this is validated, you’re ready to merge this new model into your Prismic Production repository and start populating the new content. We recommend that editors always use the Production environment to populate content. However, if you choose to create the new copies in a Dev repository, you can always use the Import/Export tools to move content to the Prod repo once the Custom Types have been updated. As soon as you publish a document, the Prismic API response will include the new field’s content. The following illustrates a typical development workflow using several Prismic environments. This might change depending on your particular development lifecycle, but that gives one example. Custom Types (configuration): The sync is achieved by copying the JSON representation of the Custom Type in the dev environment, and pasting it into the production repo. Content: If you have created content into the development or staging environment, you can use the Export/Import feature to migrate it to the production environment. The content will be imported into a Content Release within the production repository. This way you can make a final verification (using the Preview function) before publishing it live.